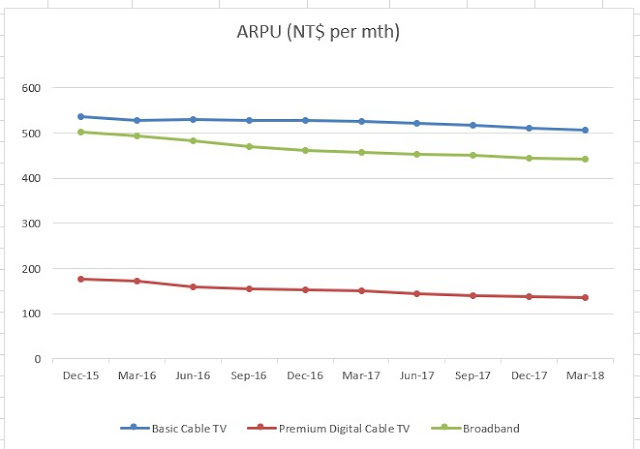 Investment Income for Life: Asian Pay TV Trust keeps spiralling downwards after Q1 2018 results. How low could it go? 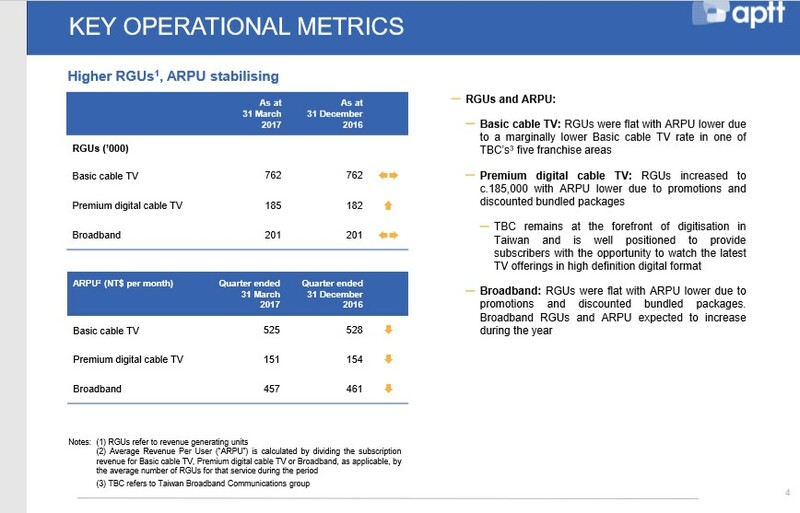 Asian Pay TV Trust keeps spiralling downwards after Q1 2018 results. How low could it go? Asian Pay TV Trust ("APTT") closed off Friday (24 May 2018) at a 52 weeks low of SGD 0.440. Based on the re-affirmed SGD 0.065 per unit of dividend guidance for FY2018 by the Management of APTT after the Q1 2018 results announcement, this represented a dividend yield of 14.77% (please see the previous post here with regard to analysis on whether the cashflow for dividend is sustainable) Is this a value trap? How low will APTT goes? When will the dumping of its units in open market stop? Why did APTT plummet recently since the release of its Q1 2018 financial results? 1. The market getting jittery based on the continued erosion in its core business earnings amidst the competition. 2. There is also the announced increase in corporate tax rate from 17% to 20% in Taiwan. I reckon that due to the pursue of populist policy by the government to reduce personal income tax, the authority have no choice but to balance the books by milking corporations. This will make the government look good for the upcoming year end election. However, this is contradictory to the overall reduction in corporate tax rates going on in the world to boost business growth and also attracting foreign investments. 3. Market interest rates are expected to keep going upwards. There is again some uncertainty by the market over the interest expenses on huge loans taken out and its financial impact on APTT. Just to add on, the interest rates on the bank loans used to be over 8.5% during the Macquarie Infrastructure days. Since then, APTT has restructured the bank loan with a drastically lowered interest rates. The interest rate is based on interbank offer rate plus 2.3%. 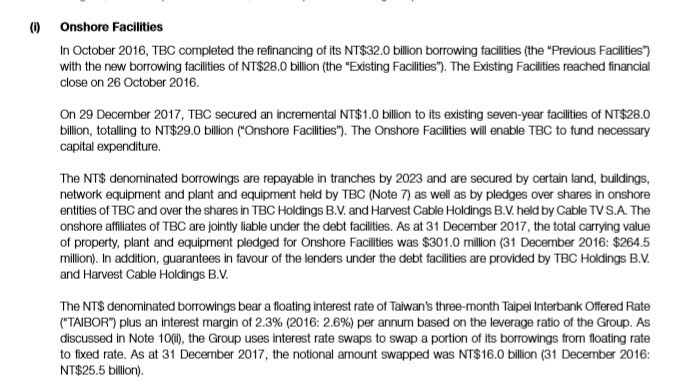 The latest loan of NT$29 billion taken in Oct 2016 will only be due in Oct 2023. Out of these, NT$16 billion has been hedged using interest rate swaps from floating rate to a fixed rate. 4. Losses in Q1 2018. This was actually due to the one off deferred taxation charge of S$11Mil taken into the books from the increase in corporate tax rates from 17% to 20%. I have mentioned in my previous post (pls see here) that there is no cashflow impact on the application of deferred taxation in FY2018. The tax view and accounting accrual view overcomplicated the situation and may have casted an aspersion on the future financial performance on top of the worsening key business indicators in pt 1. 5. Cancellation of Korean America Summit in Singapore on 12th June 2018 by US President Donald Trump? The Business Times mentioned that Asian stocks were jittery over the uncertainty of the Summit in Singapore. The 2 key operational metrics of APTT are namely, (i) Revenue Generating Units (RGU) and (ii) Average Revenue Per User (ARPU). In its presentation deck to shareholders, the management of APTT often put down ARPU as "stabilising". For example, for previous year Q1 2017, APTT reported ARPU stabilising. Then again in the recent Q1 2018 presentation to investors, APTT again used the term "ARPU stabilising". The ARPU is thus actually far from being "stable". The blood bath have not halted. ARPU is still sliding downwards almost every quarter. 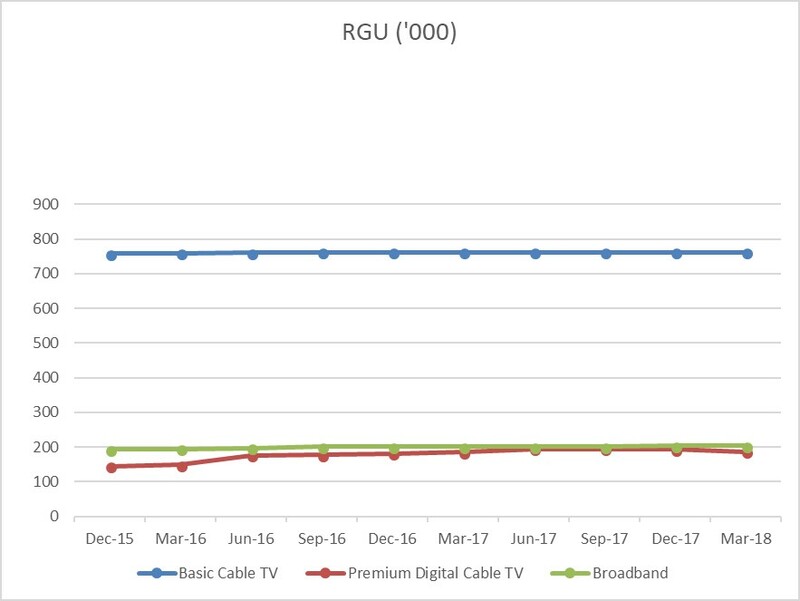 The Premium digital cable TV business segment is suffering from pricing challenges due to competitive pressures from the unlimited wireless data offerings from mobile operators. 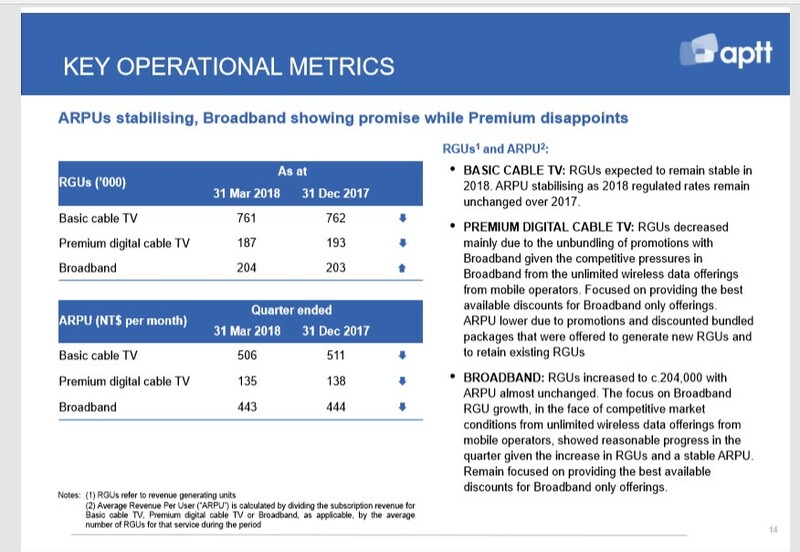 ARPU had lowered due to promotions and discounted bundled packages being offered to generate new RGUs and to retain existing RGUs. The only good news is that the RGU are indeed stable and the blood letting in terms of decline financial performance is really due to unfavourable pricing that is adversely affecting their profit margin. As to how serious is the declining ARPU or whether it will indeed eventually reached "stabilisation", investor will have to make up their mind on the future outlook. One will have to wait for the upcoming Q2 2018 results to have better visibility since the ARPU in Q1 2018 is still declining. The Dividend Discount Model is a method of valuing a company's stock price based on the theory that its stock is worth the sum of all of its future dividend payments, discounted back to their present value. Since many investors seems to treat this as a high yield stock, I reasoned that the DDM will be a useful tool for us to do some mathematical valuation to see the fair value per unit expected. g= Dividend Growth Rate (assume zero in APTT's case) in perpetuity. Now, if we assume that the Cost of Equity, based on the previous month of around 12.26%, then P = S$0.530. The risk premium and expected return from investors have increased further ever since the release of the Q1 2018 results. If we assume that the dividends going forward to be cut by 25% due to one's view that APTT will cut price further or lose more subscribers while maintaining 14.77% as Cost of Equity, P= S$0.35. Hence based on one's outlook, we see that the price range can be from S$0.35 to S$0.53. Analyst target price based on the discounted cashflow projection (another valuation methodology) priced APTT at S$0.52. Based on the slowing quarterly losses in ARPU, I will say the fair value should be around S$0.40 and with probability of favourable upsides or stabilisation in view soon. Loan facility due in 2023 means that short term continuity of the business is not likely to be a major issue as the ability of the business to service its debt is not an immediate issue yet but there is a risk by assuming no major surprises in its current revenue generating abilities. Please do share your views and outlook for APTT. Will it drop below S$0.40 or is it already oversold and represents a good opportunity right now to invest in APTT?